In the land evangelized by St. Patrick, there emerged in subsequent centuries a number of saints, who by the sanctity of their lives firmly established Christianity in Ireland. Among these is to be numbered the great St. Enda of Aran. Enda was born in the sixth century to Oriel of Ulster, son of Conall Derg of Ergall, to whose principality he succeeded upon his death. One of his sisters was married to Oengus the king of Munster; another, the holy Fanchea, was abbess of a monastery. It was the pious exhortations of the latter that compelled him to leave the world and embrace the monastic life. He embarked on a pilgrimage to Rome to venerate the relics of the Apostles and was there ordained a priest. Upon his return to Ireland, he built a church in Drogheda along the River Boyne and founded a religious community. From his brother-in-law, King Oengus of Munster, he obtained the grant of the wild and barren isle of Aran (Aranmore) in the Bay of Galway, where he founded the famous Monastery of Killeaney. Such was the fame acquired by this monastery and its abbot, that the island was called “Aran of the Saints”. Many of the great Irish saints had some connection with Aran and St. Enda: St. Brendan the Voyager, St. Kiaran of Clonmacnoise, St. Columba of Iona, St. Finnian of Clonard and others. 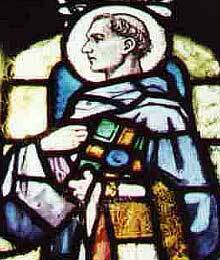 So numerous were the pilgrims to Aran that St. Columba called it “The Rome of Pilgrims”. Enda divided the island into ten parts, in each of which he built a monastery and over which he set superiors. His monastic settlement was known for its austerity, holiness and learning, and became a burning light of sanctity for centuries in Western Europe. This father of Irish monasticism died in advanced old age and was buried on Aran Mor.